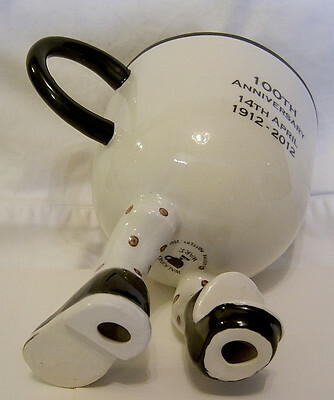 This is one of a special limited edition Kneeling Cup designed by Roger Michell of Lustre Pottery and manufactured exclusively for Artware Collectables in Stoke-on-Trent, En gland. 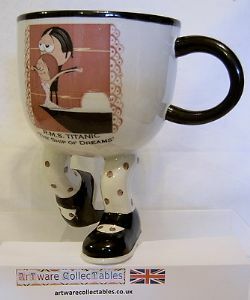 The Kneeling Cup has the stylized litho image as represented by the film of The Titanic with freehand painted additional decoration. It has a black handle, black shoes with pale lilac spotted socks. To the rear, is the tribute on the 100th. Anniversary of that fateful voyage on April 14/15 1912 . The Cup stands 5.5 inches (14 cms) tall and has a top diameter of 4 inches (10 cms). It is in perfect condition and comes from a limited edition of only 50 pieces. It is backstamped underneath in black.